Advertisers and publishers can use this data to make mobile ads better and improve business outcomes. For example, Sridhar shared how Cadreon used cross-device measurement in DoubleClick for an auto client to measure the impact of mobile on each conversion, ultimately realizing a 15% lift in total conversions and developing new insights to feed back into their media planning. Six months ago at the US DoubleClick Leadership Summit, we announced the start of testing for Programmatic Guaranteed, a new way to use programmatic pipes to execute direct deals. In this time, over 300 advertisers and 200 publishers have tested this capability, and we’ve seen impression volumes double every quarter. Based on your feedback, we’ve made several changes and significantly improved the product. So today, we’re announcing the public beta of Programmatic Guaranteed and opening it to any advertiser using DoubleClick Bid Manager or publisher using DoubleClick for Publishers*. Programmatic direct spending was expected to reach $8 Billion in 2015 in the US alone - more than 50% of total programmatic display ad spend1. Initial steps to bring the benefits of programmatic to direct deals have been focused on automating the deal booking process. While that’s a good start, it only scratches the surface of what programmatic technology can do. The true value of programmatic direct will be achieved when the power of real-time, data-driven decisions is combined with access to brand safe, reserved publisher inventory currently available through direct sales. This will not only shorten the time it takes to book and execute high value reservations type deals, but also improve advertising performance. That was our goal when developing Programmatic Guaranteed. It’s the only product available today that uses real-time bidding infrastructure to bring the power of programmatic to direct sales. Advertisers and agencies get access to premium guaranteed inventory with cross-campaign / advertiser optimization and frequency management across programmatic and reservation inventory. Publishers can lock in revenue through reservations, forecast against programmatic deals, and enjoy the ease of automated billing and collections. All that without the need to email tags, worry about creative controls, resolve discrepancies, or fax I/Os back and forth. "As a premium publisher we will automate what today is manual. Programmatic Guaranteed is definitely an end to end solution. It is exactly what a publisher like Conde Nast needs to do more in a digital environment that is constantly changing and becoming more demanding." "Programmatic Guaranteed helps the publisher deliver very high quality inventory to the advertiser. When we start a campaign, we always have to start with the publisher: we then fix the price with the publisher, define the placement, the timeline and then we define the volume. Through this, if you compare direct sales with Programmatic Guaranteed, we are returning better results." Programmatic Guaranteed is now available to all marketers and buyers using DoubleClick Bid Manager, and all publishers using DoubleClick for Publishers. If you have a reservation deal that would benefit from the efficiencies of programmatic, reach out to your DoubleClick account team today to get started. We’re excited to bring this innovative advertising tool to the market and we look forward to your feedback on how we can best improve Programmatic Guaranteed during the public beta. A Programmatic New Year: What’s your resolution for 2016? At this time last year, we suggested three resolutions for 2015 to help you achieve more success with your programmatic campaigns. Since then, the landscape has continued to evolve for marketers. There are more devices, more micro-moments, more ways to reach consumers. Not surprisingly, more people want to know about programmatic, too: Google searches for “programmatic” were 46% more popular this year vs. last year, and more than twice as popular from just two years ago1. For 2016, we’re sharing some new resolutions — and want to help you find the one that is just right for you. Programmatic New Year is an interactive quiz that recommends personalized “programmatic resolutions”. These are ways you can further develop your brand’s programmatic strategy for 2016. Whether you’re experienced in programmatic or just getting started, the resolutions serve as a starting point for building your expertise, identifying opportunities and helping your brand succeed. 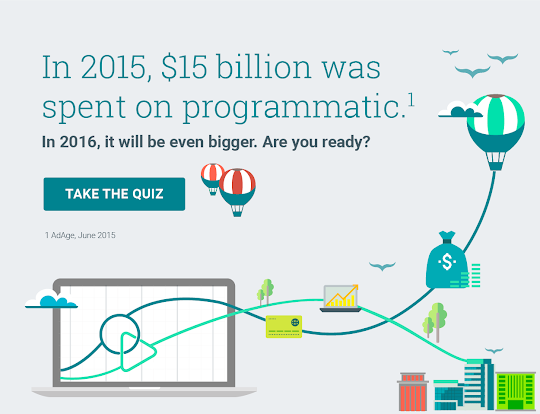 Take the quiz to find out your Programmatic New Year’s resolution. Consider sharing your resolution with friends and colleagues—it might just help you stick to it.